When you are searching for treasure, don't waste time aimlessly digging for your find. Freehawk Pinpointer Metal Detector is great to help you pinpoint your treasure before you start digging. √ Bright orange in color for better visibility and to prevent its accidental loss in the field. √ Programmed for extreme sensitivity to pinpoint coins, jewelry, gold nuggets and even small rings hard to find. √ Small size pinpointer with a holster and a string rope, makes it ultra portable and convenient to hold or hang on the belt. √ All-New Powerful and super-sensitive Pinpointer with advanced electronics and all of the features metal detectorists have asked for, plus even more! √ With a full 360 degree detection pattern not only on the tip, but on the lower detecting shaft. No worry about missing the precious treasure you are searching for! √ Three sensitivity levels with different LED indicators light, audio and vibrate alert. Audio / Vibration LED Beam Lights Response will be Intense when Probe Close to Objects. √ Quick button press instantly tunes out environment or narrows detection field for precise pinpointing of larger targets; allows user to quickly turn out the detection, without having to step through multiple. Indicator: LED indicators, Audio, Vibration. 1 x Pinpointer Metal Detector. Extremely high sensitivity for improved detection of small targets, it can work indoors, outdoors, on sand, lawn or in soil, locate coin, silver, jewelry and gold with speed and accuracy. 360° side-scan and Pinpoint tip detection, with a full 360 degree detection pattern not only on the tip, but on the lower detecting shaft. No worry about missing the precious treasure you are searching for. Three sensitivity levels with different LED indicators light, audio and vibrate alert. Audio / Vibration LED Beam Lights Response will be Intense when Probe Close to Objects. Quick button press instantly tunes out environment or narrows detection field for precise pinpointing of larger targets; allows user to quickly turn out the detection, without having to step through multiple. 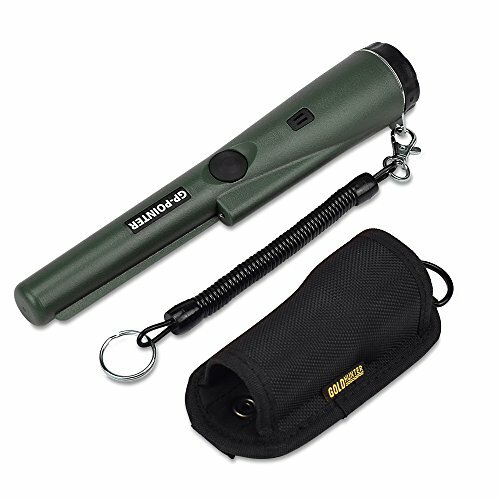 Small size pinpointer with a holster and a string rope, makes it ultra portable and convenient to hold or hang on the belt. View More In Metal Detectors. If you have any questions about this product by Freehawk, contact us by completing and submitting the form below. If you are looking for a specif part number, please include it with your message.